The ecological value of the DMZ is different according to areas. The DMZ is a demilitarized zone under the international law, we call it the military armistice agreement, so people’s access is limited. The ecosystems of the DMZ, therefore, should be preserved paradoxically. Some areas are damaged by military operations, but rest of areas are relatively well preserved. 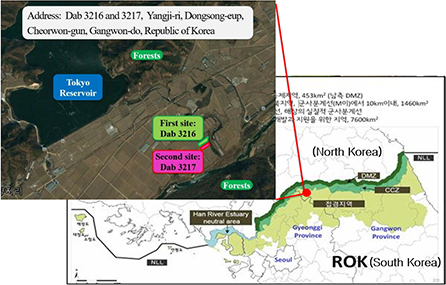 The recent survey conducted by the National Nature Trust shows the ecosystems of the DMZ and nearby areas within the CCZ(Civilian Control Zone) are not better than those of the Great Baek-du-dae-gan mountains, but better than those of coastal areas. There is an urgent need to promote mutual collaboration to preserve and restore ecosystems and biodiversity around the DMZ for the benefit of people and wildlife now and in the future in South and North Korea. There are two reasons why we should focus on ecological value and ecosystem services of the DMZ and the CCZ. First of all, we can promote South and North Korea environmental collaboration making use of ecological values of the DMZ areas. South Koreans can voluntarily purchase ecosystem services, so-called nature’s benefits, produced by North Koreans. The collected financial resources will support environmental conservation activities in North Korea and this will result in South and North Korea environmental collaboration. Secondly, the DMZ should be kept as a green area for future generations. The DMZ is an ecological axis traversing Korea from East to West. Without conservation strategies of the DMZ, Korean reunification will create conflicts between conservation and development. If the DMZ is developed after reunification, the ecosystem and biodiversity will be greatly destroyed. 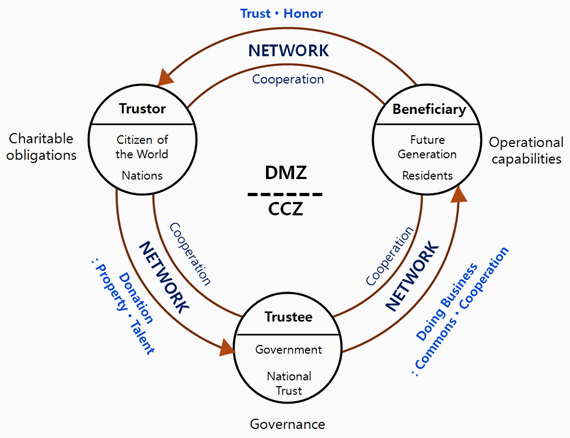 DMZ Eco-Trusts are equivalent to the Green Securities issued by the German NGO, BUND. Eco-Trusts are donation-based certificates and they are not profit-making securities. The collected revenue will be used only for conservation and restoration of the DMZ. Eco-Trusts are developed forms of the Green Securities. Eco-Trusts need a few conditions to receive public support. First of all, eco-trusts are tradable among relatives even if they are donated certificates. Eco-trust holders can provide certificates as gifts to their families, friends and relatives. The last holders will receive tax incentives. Eco-trusts fund should be used transparently. Certificate buyers can get to know how their money is spent at any time. Eco-trust revenues will be used to support land owners and NGOs who provide efforts to conserve ecosystems and wildlife habitats around the DMZ. If inter-Korean relations become improved, the eco-trust fund can be also used to improve North Korean environment. responsible for managing the DMZ. National Nature Trust purchased rice paddy fields (4,776.7 square meters in total) on 25 November 2016. This area is the first site for DMZ Global Trust. These lands are located in adjacent area of Korean DMZ and play a role as habitats of endangered Cranes. Purchasing funds come from the donation of a social corporation(Lam Research Korea) and DMZ Eco-Trusts fund of National Nature Trust. Through this land purchase, National Nature Trust can secure the habitats of endangered Cranes. National Nature Trust will preserve these lands effectively and restore the adjacent ecosystem gradually for sustainable habitats of endangered Cranes. After purchasing these rice paddy fields, National Nature Trust entered into a MOU with Korea Crane Protection Association (KCPA) on 21 December 2016. Lam Research Korea also participated in this ceremony as an observer. National Nature Trust and KCPA agreed to cooperate with each other for conserving these rice paddy fields as the habitat of endangered Crane. Moreover, National Nature Trust transplanted rice at the trusted paddy fields with Lam Research Korea’s employees and their families on 20 May 2017. National Nature Trust will manage these paddy fields ecologically according to traditional and sustainable agricultural techniques for the habitats of Cranes. In addition, National Nature Trust will feed Cranes stably in dry season with local people and other stakeholders. To successfully manage the DMZ like the example of the Green-belt in Germany, the willingness of politicians should come first. The DMZ should not remain as a prohibited land of inter-Korean confrontation. Politicians should open political chains of the DMZ. Inter-Korean Trust and cooperation are prerequisite for the future of the DMZ. Trust and cooperation can start from a small thing. South and North Koreans can initiate a project to conserve and share ecosystem services such as waters from the Imjin River. It is possible to restore ecosystem of the northern part of the DMZ in North Korea and South Koreans can purchase ecosystem services produced there. Because the DMZ is a transboundary area and situated in a center of international politics, it requires international collaboration. We should collect willingness and efforts of international organizations, politicians, economists and environmental and peace activists working for international peace. The National Nature Trust initiated “the DMZ Global Trust for Peace and Biodiversity” to induce public-private partnerships inside and outside of Korea. The DMZ Eco-Trusts for PES will provide financial resources for this DMZ global initiative.